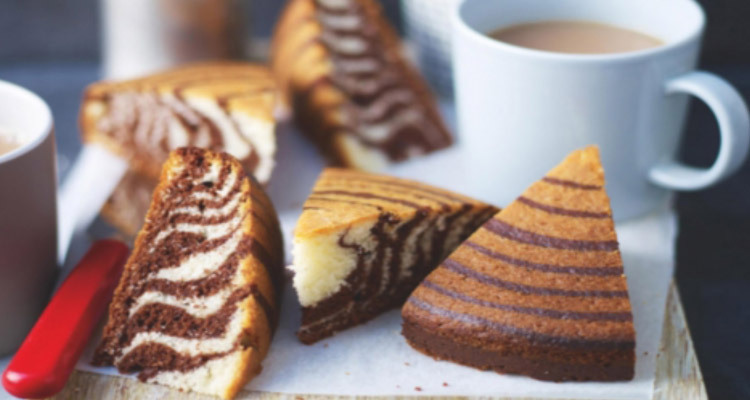 I’ve been meaning to make Lorraine Pascale’s Crouching Tiger, Hidden Zebra Cake for ages, it was one of my new year resolutions and it’s now on top of my to-do list. A really fun cake to make with the babas. Preheat the oven to 180°C, (fan 160°C), 350°F, Gas Mark 4. Grease the bottom of the sandwich tin with a little oil, line with baking parchment and oil again. Set aside on a large baking sheet. Put the oil, sugar, milk, eggs and vanilla extract in a large bowl and beat everything together well. It is best not to use an electric whisk as it will introduce too many bubbles, which are not needed for this cake. Pour out 400ml of this mixture (or 400g as it is the same in weight) into a medium bowl. Sift 175g of the self-raising flour into one bowl along with &frac12; teaspoon of the baking powder. Mix well and set aside. This is your vanilla mix. Sift the remaining 125g of self-raising flour and &frac12; teaspoon of baking powder into the other bowl along with the cocoa powder. Finely grate the orange zest in, mix everything together well and set aside. This is your chocolate mix. Now, put a tablespoon of the vanilla mix in the middle of the tin. Then, using a clean tablespoon, put a blob of the chocolate mix in the middle of the vanilla one. Keep doing this, alternating between vanilla and chocolate, so you form a type of ‘bull’s eye’ or ‘target board’ look. Each time you dollop a blob in, the whole mix will spread out on the base. By the time you have used up both of the cake mixes, they should have just reached the edge of the tin. Check the cake is cooked by inserting a skewer into the centre. It should come out clean. If not, then return to the oven for another 5 minutes or so until cooked. Once cooked, remove from the oven and allow to cool for a few minutes in the tin. Then carefully remove from the tins and leave to cool completely on a wire rack (but it is also fine to eat it warm!). Cut the cake into six wedges to reveal its spongy gold. Arrange on a cake stand or platter and serve. For more recipes from Lorraine, click here.